There was talk earlier in the winter Dobmeier was going to run the All Stars. Has anyone heard anything? Honestly I don't see how he would being based out of the Dakotas, but it would be nice to have another quality car following. Didn't really hear that rumor, but I don't see it either. 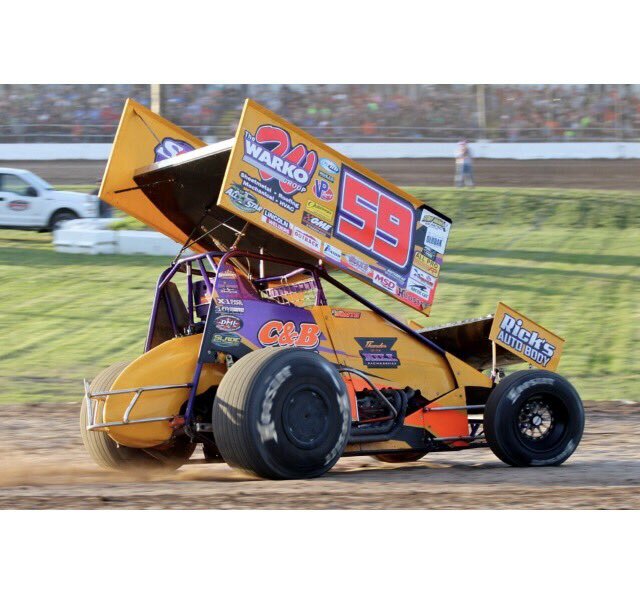 Heck he had a heck of a drive just to Knoxville every week which is around 9 hours plus ... so your probably looking at 16 hours to Ohio tracks such as Attica. The only way he would be able to do it is relocate to Indianapolis area or something (IMO). There are a couple more quality teams that most likely will sign-up. I'm expecting 13 Members. With who has already announced that would be a good group for the All-Stars. 11) ??? Lee Jacobs ??? 12) ??? Ryan Smith ??? 13) ??? T.J. Michaels ??? Shaffer for about 75-85% of the races like last season as well. Going to be another great season! I don't see why he wouldn't run it again unless couldn't get the Warko 94 for the Central PA events. He's certainly got enough talent to run the all stars there's no doubt in mind of that. How long has it been since Jac has ran a family owned car? I know he's been in a ton of rides but obviously am too young to know if he ever did that at all honestly. Now that is a surprise for sure ... hopefully he can make the entire season since it sounded like in the article he had limited resources, cars, parts, etc... Be nice to get some more non-wing guys to convert over to the wing racing. So that means 11 drivers/teams so far for the All-Stars series. Not that anyone would ever listen to me, but shouldn't tow money be paid out MORE to the guys who didn't finish well and need it the most to get there and back home? I mean, if you place in the Top 5 in the points for FL...you have money to pay expenses. Its the guys who struggled that will get the least amount of tow money and if you know you're not going to be a top contender, you're going to leave your car parked in the shop. If they want to boost car counts, flip the tow money breakdown the other way. Not just for FL, but all season long. That's my piece of advice for ALL traveling series. Done ranting...carry on. I don't really agree with this because the simple fact of rewarding teams for being bad just doesn't seem to make sense. I understand what you mean by giving more money to the lower teams, but if 200.00 is making or breaking you going on the road than not sure it will make a difference. Why punish a team for doing well on the track by not giving them more money to get to the next track, but then give it to the lower team. In some cases it could be with the final payout that the lower team in the A-main could make more money than a guy just ahead of them because of the tow money in your scenario. If traveling series gets 12-15 teams to follow them on a regional or national series that is pretty good (IMO). Like last year the All-Stars had nearly 20 teams starting out with the series and most of them nobody knew who they were and only really cared for the top 5 guys and those are the ones that the fans want to make sure get to the track. Here’s a resolution to the tow money issue. Tow money should not be on a graduated basis. If the top 10 are being paid, all should be paid equally, because it costs everyone the same per mile to get to a race. The better teams will make more money per night based on their higher finish, as it should be, but tow money should be the same for all 10 or 12 or however number of positions are paid. I would think no matter what your opinion is on this issue, all would probably agree we don’t need constant turnover. It takes more than a half dozen or so full time travelers to make a traveling series a strong attraction at the front gate. Lasty, I think most posters on forums don’t own or sponsor cars and have no idea what the true costs are ( not condemning anyone here ). Just Food For Thought from a long time owner / sponsor. I agree that it should be the same for all, but then certain issues happen ... The issue becomes when you have more cars/teams than the allocated tow money too. The All-Stars in most years only had roughly 12 teams so the tow money was basically the same, but the issue became last year when they had 20 teams at the beginning of the year so that is when the different tow money packages started. Fans/tracks complain about the All-Star fees and all that type of thing, but if your going to give the same amount to all teams than the All-Star fees will go up and then we will hear more tracks/fans whining about how much the fees are or going up all the time. Also I agree with the All-Stars that giving the extra money to the champ is a good reward not only for what a team/driver did the previous year, but also trying to retain him the following year and not moving on or looking to move up to the WoO's. That works, too. Keep the little guys in business and keep the car counts healthy.